Aging is characterized by increased T cell lymphopenia, T cell dysfunction, and increased serum TNF levels. In this study, we have examined the role of TNF-induced apoptosis in T cell deficiency in lymphocytes from aged humans. The constitutive expression of TNF receptors (TNFRI and TNFRII) and the adapter molecules, including TNFR-associated death domain protein (TRADD), TNFR-associated factor 2 (TRAF-2), and receptor interacting protein (RIP), were analyzed both at the protein level by flow cytometry or Western blotting, and at the mRNA level using quantitative PCR or Northern blotting in lymphocytes from aged and young subjects. The susceptibility of T cells to undergo TNF-induced apoptosis was analyzed using terminal deoxynucleotidyltransferase-mediated UTP-end-labeling (TUNEL) and DNA ladder assays. Caspase (caspase-8 and caspase-3) activation was compared between aged and young subjects using Western blotting and colorimetric assays. In lymphocytes from aged humans, there was an increased susceptibility of CD4+ and CD8+ T cells to undergo TNF-α-induced apoptosis, as observed by TUNEL assay and DNA fragmentation ladder assay. Increased TNF-α-induced apoptosis was also observed in both CD45RA+ and CD45RO+ T cells from aging subjects. An increased constitutive expression of TNFRI and TRADD and decreased expression of TNFRII and TRAF-2 were observed in lymphocytes from aged as compared with young controls. In addition, there was an early and increased activation of caspases (caspase-8 and caspase-3) involved in TNFR/TNF signaling pathway, as evident by early cleavage of caspase-8, poly(ADP-ribose) polymerase (PARP), and caspase-3 substrate DEVD-p-nitroamilide NA. These data suggest that an increased TNF-α-induced apoptosis may play a role in T cell deficiency associated with human aging. Tumor necrosis factor-α is a 17-kDa pleiotropic cytokine that is produced by a large number of cell types and mediates a wide variety of inflammatory and immunologic responses 1, 2, 3 . In vivo, it acts as an antiviral agent because cells infected with a number of viruses are susceptible to inhibition by TNF 4, 5 and TNF-mediated killing resembles apoptosis characterized by membrane blebbing and DNA fragmentation 6 . TNF exerts its effects by binding to two cell surface receptors (TNFRI and TNFRII). Both receptors are present on a wide variety of cell types 7, 8 . The cytotoxicity of TNF is regulated by two kinds of opposing activities: 1) protein synthesis-independent cytotoxic mechanisms and 2) protein synthesis-dependent cell-protective mechanisms. The balance between these destructive and protective effects allows TNF to act selectively in destroying diseased and transformed cells without affecting the viability of normal cells. The protein synthesis-independent cytotoxic pathway involves interaction of death domain-containing adaptor molecules and caspases leading to apoptosis, whereas the protein synthesis-dependent protective pathway involves activation of transcription factors, including NF-κB2 (reviewed in 9 . Recently, we have shown that T cells from aged humans have an increased susceptibility to Fas-mediated apoptosis as compared with young subjects 10 . Because the downstream signaling pathways in Fas-induced apoptosis and TNF-induced apoptosis are similar, and serum TNF-α levels are elevated in the aged humans 11, 12, 13, 14 , we studied the role of TNF-α in T cell apoptosis in aged humans. The data show an increased TNF-induced apoptosis in T cells from aged subjects that is associated with increased expression of TNFRI and TRADD and a decreased expression of TNFRII and TRAF-2. Furthermore, an increased and early activation of caspase-8 and caspase-3 was observed in lymphocytes from aged humans as compared with young controls. Peripheral blood was obtained from 15 healthy young male (20–29 yr) and 15 aged male (65–95 yr) volunteers. All aged subjects were Emeritus Faculty members, and all young subjects were students, residents/fellows, and staff members of the University of California (Irvine, CA). Some of the aged subjects were taking multivitamins. The protocol was approved by the Institutional Review Board, University of California. mAbs against TNFRI and TNFRII were purchased from Caltag (South San Francisco, CA). Directly conjugated mAbs against CD4, CD8, CD25, CD38, CD69, and their isotype controls were purchased from Becton Dickinson (San Diego, CA). mAbs against TRADD, RIP, caspase-3, and HRP-conjugated goat anti-mouse Abs were obtained from Transduction Laboratories (Lexington, KY). Polyclonal Ab against caspase-8 (Mch5, raised in goat) and HRP-conjugated goat Ab were from Santa Cruz Technology (Palo Alto, CA). mAb against PARP that recognizes both native and cleaved fragment was obtained from PARP Laboratories (Quebec, Canada). Plasmids pRK-myc-TRADD, pRK5-TRAF-2, and pRK-Flag-RIP were a gift from Dr. D. V. Goeddel (Tularik, South San Francisco, CA). Plasmids were grown in Escherichia coli HB101, and plasmid DNA were purified on tip 100 Qiagen columns (Qiagen, Chatsworth, CA). Purified DNA were digested with 1) BamHI/SalI to give ∼1.5-kb TRADD insert, 2) SalI/NotI to give ∼2-kb TRAF-2 insert, and 3) BamHI/HindIII to give ∼1.5-kb RIP insert. Primers for RT-PCR were synthesized by Clontech (Palo Alto, CA). The sequences were as follows: TNFR-I, sense, 5′-ATT TGC TGT ACCC AAG TGC CAC AAA GGA ACC-3′, and antisense, 5′-GTC GAT TTC CCA CAA ACA ATG GAG TAG AGC-3′; TNFR-II, sense, 5′-GAA TAC TAT GAC CAG ACA GCT CAG ATG TGC-3′, and antisense, 5′-TAT CCG TGG ATG AAG TCG TGT TGG AGA ACG-3′. B-actin primers were synthesized by Chemgenes (Waltham, MA). PBMC were separated from whole blood by Ficoll-Hypaque density-gradient centrifugation. Cells were resuspended in RPMI 1640 containing 10% FCS, penicillin (10 U/ml), streptomycin (100 μg/ml), and l-glutamine (1 mM) at 2 × 106/ml. MNC contained 90–92% CD3+ T cells, 4–5% CD19+ B cells, and <5% CD14+ monocytes. Cells were cultured with anti-CD3 mAb (25 ng/ml) for 48 h, followed by culture in IL-2-containing medium (10 ng/ml) for another 4 days. The cells were then washed and incubated with or without TNF-α (1 μg/ml) for another 24 or 48 h.
To determine any difference in apoptosis in CD45RA+ and CD45RO+ T cells, MNCs (2 × 107) from two aged and two young subjects were first passed through nylon wool column to purify T cells. These were >98% T cells, as determined by staining with anti-CD3 mAb using FACScan. Purified T cells were then separated into CD45RA+ and CD45RO+ subpopulations by incubating T cells with anti-CD45RO mAb and separating positively selected (CD45RO+) and negatively selected (CD45RA+) T cell subsets using anti-mouse IgG-coated magnetic beads (beads:cells ratio of 1:2), according to manufacturer’s instructions (Dynal, Great Neck, NY). The purity of CD45RA+ and CD45RO+ cells was >96%, as determined by staining with corresponding mAbs and using FACSscan. The freshly isolated MNC were incubated first with PE-labeled CD4 and CD8, and FITC-labeled CD25, CD38, or CD69 mAbs for 30 min on ice. Cells were washed in PBS, and CD4+ and CD8+ T cells expressing above activation markers were determined using a FACScan and analyzed using Consort 30 software (Becton Dickinson). TNFR (TNFRI and TNFRII) expression was examined on freshly isolated lymphocytes from aged and young subjects using the method described by Lazdins et al. 15 . Briefly, MNC were harvested and washed twice before resuspending in 0.01 M sodium citrate buffer (pH 4) at 4°C for 5 min to remove excess TNF bound to receptors. After further washes, cells were resuspended in ice-cold wash buffer (PBS, 5% heat-inactivated FCS, 0.02% NaN3). All subsequent incubations were done at 4°C. For each analysis, 1 × 106 cells were incubated with unconjugated mAbs specific for the p55 (TNFRI) or for p75 (TNFRII) (1 μg/ml; Caltag) or isotype-matched control Abs for 30 min, washed twice, and then incubated with a 1/100 dilution of goat anti-mouse IgG-PE (5 μg/ml). Cells were washed again and counterstained with FITC-labeled anti-CD4 or anti-CD8 mAbs for another 30 min on ice. Cells were rewashed, fixed with 1% paraformaldehyde, and analyzed using a FACScan. Results are expressed as mean fluorescence channel intensity as well as percentage of positively stained cells. Cells with mean fluorescence channel intensity significantly greater than that obtained using isotype control Abs are considered positive. TUNEL assay was performed to determine the percentage of cells undergoing apoptosis following TNF-α treatment. Cells (5 × 105) were washed in Dulbecco’s PBS (DPBS) and incubated in the presence of PE-labeled anti-CD4 or anti-CD8 Abs for 45 min on ice. Following incubation, cells were washed twice in DPBS containing 0.1% BSA and 0.1% NaN3, and fixed with 4% paraformaldehyde for 30 min at room temperature. Cells were washed at 4°C and permeabilized with sodium citrate buffer containing 0.1% Triton X-100 for 2 min on ice. After washing, cells were incubated with FITC-conjugated dUTP in the presence of terminal deoxynucleotidyl transferase enzyme solution for 1 h at 37°C using cell death detection kit (Boehringer Mannheim, Indianapolis, IN). Following incubation, cells were washed with DPBS, and 5000 cells were acquired and analyzed by dual-color analysis using FACScan. Markers were set using unstimulated cells. DNA fragmentation assay was assessed by gel electrophoresis. Cells were harvested and centrifuged at 500 × g for 5 min and washed twice with PBS. The cell pellet was lysed in 400 μl lysing buffer containing 10 mM Tris-HCl (pH 7.5), 10 mM EDTA, 0.1% SDS, and 0.2% Triton X-100 and proteinase-K (0.1 mg/ml) at 50°C for 16 h, followed by incubation with 50 μg/ml RNase A for an additional hour at 50°C. DNA was extracted once with phenol-chloroform-isoamyl alcohol (25:24:1) and twice with chloroform-isoamyl alcohol (24:1). The aqueous phase was precipitated with 2 vol of 100% ethanol at −20°C overnight. The precipitates were rinsed with 70% ethanol, air dried, dissolved in TE buffer (10 mM Tris-HCl, pH 7.5, and 1 mM EDTA), and electrophoresed in 1.8% agarose gel with loading buffer. Gel was stained with 5 mg/ml ethidium bromide for 30 min, destained overnight, and photographed under UV transilluminator. Cellular lysates were prepared, and 20 μg of cellular proteins was loaded onto 4–20% Tris-glycine gel and electrophoresed. The blots were transferred onto nitrocellulose paper and incubated with primary Ab for 3 h at room temperature in Tris-buffered saline containing 3% skim milk and 0.1% Tween-20 (TBS-MT). The blots were washed thrice in TBS-T and incubated with HRP-conjugated secondary Ab for another hour in TBS-MT. The blots were washed as before and developed using enhanced chemoluminescence detection method. The blots were scanned (QuantScan, Molecular Devices, Menlo Park, CA), and the data are represented as OD of the integrated volume (×10−3). Expression of TRADD, TRAF-2, and RIP at mRNA levels was determined using Northern blotting. Total cellular RNA was separated by electrophoresis in a denaturing agarose gel containing 6.5% formaldehyde, transferred onto nylon membranes (Schleicher & Schuell, Keene, NH) by capillary blotting in 20× sodium chloride and sodium citrate buffer (SSC) for 20 h, and cross-linked to the membrane by UV irradiation. 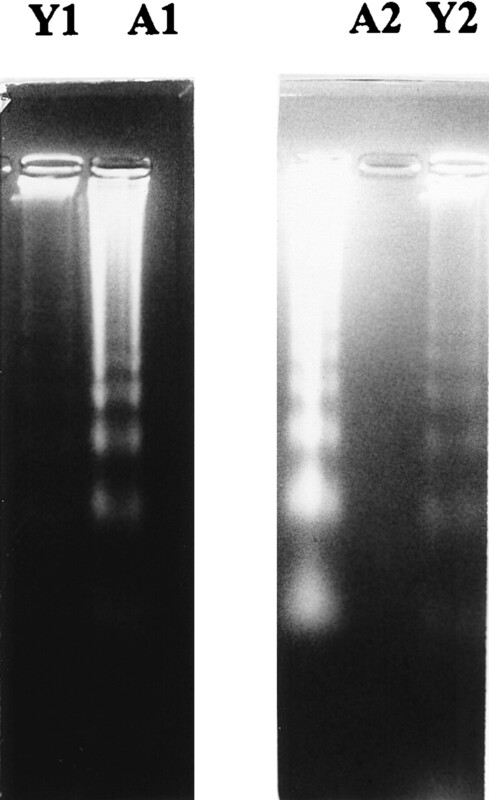 The blots were prehybridized at 42°C for 6 h in a solution of 5× SSC, 5× Denhart’s solution, 50 mM EDTA, 10 μg/ml poly(A), 100 μg/ml yeast RNA, and 200 μg/ml heat-denatured salmon sperm DNA. Hybridizations were done for 20 h at 42°C in the same solution containing 10% dextran sulfate and [α-32P]dATP-labeled probe (2 × 106 cpm/μl), labeled using Random priming labeling kit (Amersham, Arlington Heights, IL). The blots were washed under stringent conditions at 0.2× SSC at 65°C for 1 h and exposed to X-OMAT AR film (Eastman Kodak, Rochester, NY) at −80°C for 16 h with an intensifying screen. The blots were scanned (QuantScan, Molecular Devices) and the data were represented as OD of the integrated volume (×10−3). Total cellular RNA was extracted from unstimulated MNC from young and aged subjects. cDNA was synthesized using 200 ng of total cellular RNA and 100 ng random hexamers in 20 μl of a solution containing 50 mM Tris-HCl, 75 mM KCl, 3 mM MgCl2, 10 mM DTT, 500 μM each of dNTPs, and 10 U RT using RT-PCR kit (Perkin-Elmer, Branchburg, CT). For quantitation, graded amounts of cDNA obtained from the same tube were used and PCR was conducted as described 11 for 25 cycles. Each cycle of PCR included 1 min of denaturation at 94°C, 1 min of primer annealing at 60°C, and 2 min of extension/synthesis at 72°C. Sense and antisense primers for TNFRI and TNFRII were obtained from Clontech. TNFR-I primers gave 587-bp and TNFR-II gave 403-bp PCR product. β-actin primers were synthesized from Chemgenes and were used as internal controls. Results are expressed in OD ratio for TNFRI:β-actin and TNFRII:β-actin. Statistical analysis was performed using paired Student’s t test. The expression of TNF receptors (I and II) on T cell subsets from aged and young was determined with mAbs using dual-color flow cytometry. Fig. 1⇓A shows data of TNFRI and TNFRII expression in CD4+ and CD8+ T cell subsets from 10 aged and 10 young subjects. expressed as MFC# (mean fluorescence channel numbers) as a reflection of change in density of the receptor (mean ± SD). A significantly higher (p < 0.002) expression of TNFRI was observed in both CD4+ and CD8+ T cell subsets in lymphocytes from aged (CD4+, 235 ± 25; CD8+, 212 ± 22) as compared with that from young controls (CD4+, 144 ± 18; CD8+, 122 ± 21). 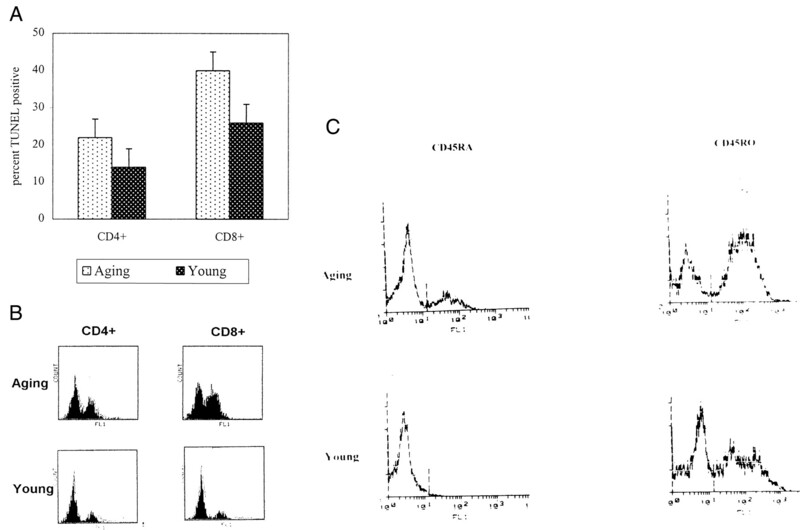 Furthermore, there was a significant decrease (p < 0.002) in TNFRII expression in both CD4+ and CD8+ T cell subsets in lymphocytes from aged (CD4+, 350 ± 25; CD8+, 212 ± 23) as compared with that from young controls (CD4+, 462 ± 24; CD8+, 316 ± 22). Fig. 1⇓B shows the results of the proportions of TNFR-I- and TNFR-II-positive CD4+ and CD8+ T cells from 10 aging and 10 young subjects. A significant increase (p < 0.001) in the proportions of TNFR-I-positive CD4+ and CD8+ T cells (% mean ± SD) from aged subjects (CD4+, 28 ± 6; % CD8+, 35 ± 6) was observed as compared with young subjects (CD4+, 18 ± 4; CD8+, 15 ± 7). Proportions of TNFR-II-positive CD4 and CD8 cells were significantly decreased (p < 0.001) in aged (CD4+, 14 ± 7; CD8+, 12 ± 9) as compared with young subjects (CD4+, 33 ± 12; CD8+, 27 ± 9). TNF receptor (TNFRI and TNFRII) expression in T cell subsets. Freshly isolated MNC from 10 aged and 10 young subjects were stained using TNFRI, TNFRII, CD4, or CD8 mAbs. CD4+ and CD8+ T cells and percentage of cells expressing TNFRI or TNFRII and their mean fluorescence channel intensities were determined using FACScan. A, Data (mean ± SD) for MFC# of TNFRII and TNFR-II. 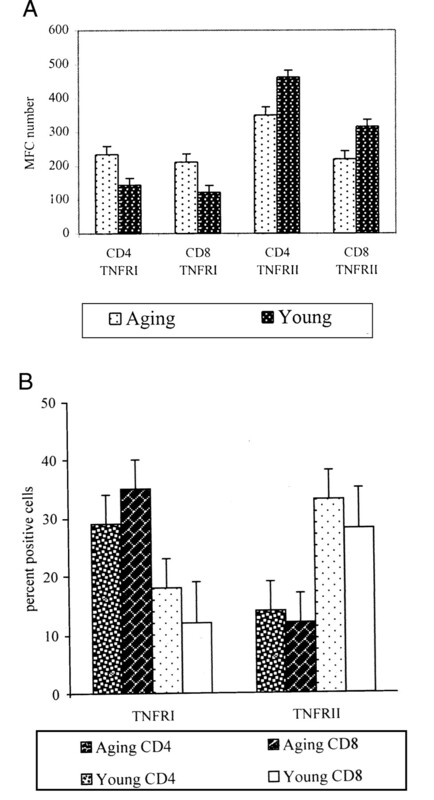 B, Proportions of TNFR-I- and TNFR-II-positive CD4+ and CD8+ T cells from 10 aged and 10 young subjects. To determine whether the changes in TNFRI and TNFRII in aged are due to transcriptional versus translational events, we compared the expression of TNF receptors (TNFRI and TNFRII) at the mRNA level, using quantitative PCR. The data (mean ± SD) from three aged and three young subjects using 1 μl and 2 μl cDNA are shown in Fig. 2⇓A. The linearity of the quantitative PCR was determined for one aged and one young subject using graded (0, 1, 2, 4, and 8 μl) amounts of cDNA (data not shown). Fig. 2⇓B shows a representative gel photograph (of three experiments) for quantitative PCR from one aged and one young subject (in triplicate). The figure shows an increased TNFRI mRNA and a decreased TNFRII mRNA expression in lymphocytes from aged as compared with young controls. TNFRI and TNFRII mRNA expression in lymphocytes. A, A total of 1 μl and 2 μl cDNA was obtained following RT using 100 ng of total cellular RNA and PCR conducted in triplicate for 25 cycles using TNFRI, TNFRII, and β-actin primers. 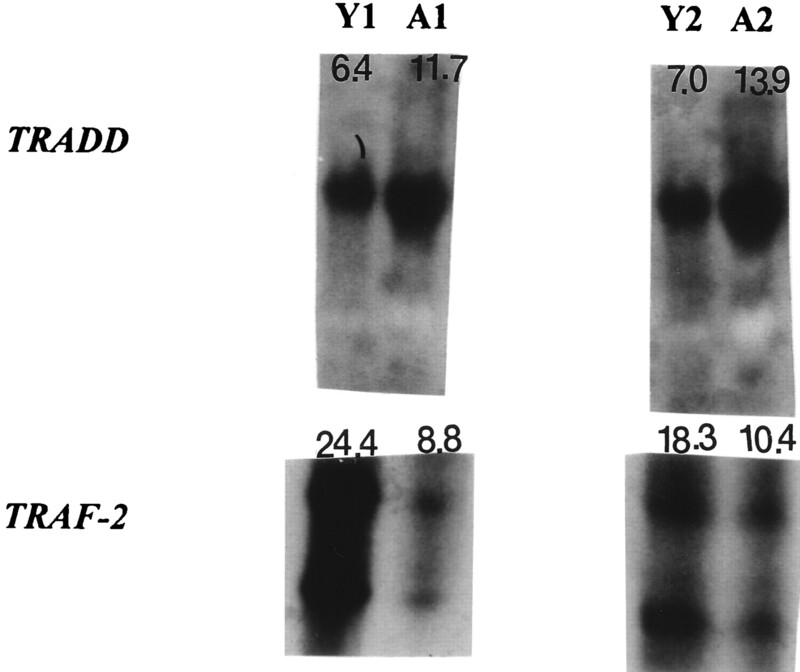 PCR products were electrophoresed and exposed to x-ray film for 4 h. Mean ± SD data (in OD ratio) from three aged and three young subjects are shown. B, Representative gel photograph from one aged and one young subject is shown using 2 μl cDNA. To determine whether increased proportions of T cells expressing TNFRI and TNFRII from aged humans are due to higher number of activated T cells, we compared the expression of activation Ags on CD4+ and CD8+ T cells from three each aged and young subjects. No significant increase in the proportions of CD4+ or CD8+ T cells expressing activation Ags (CD25, CD38, and CD69) was observed in aged subjects (Table I⇓). There was modest decrease in the expression of CD38 on CD8+ T cells from aged subjects as compared with young subjects. MNCs were activated with anti-CD3 Ab for 48 h and then cultured in IL-2-containing medium for another 4 days. The cells were then treated with TNF-α (1 μg/ml) for an additional 48 h, and the percentage of apoptotic cells was determined by TUNEL assay. Fig. 3⇓A shows data (mean ± SD) from 10 aged and 10 young subjects. A significantly increased (p < 0.01) proportion of both CD4+ and CD8+ T cell subsets from aged underwent TNF-induced apoptosis (CD4+ TUNEL+, 22 ± 5; CD8+ TUNEL+, 40 ± 10) as compared with young controls (CD4+ TUNEL+, 14 ± 4; CD8+ TUNEL+, 26 ± 7). A representative TUNEL graph is shown in Fig. 3⇓B. To determine whether the increased T cell apoptosis observed in aged subjects is due to increased number of memory cells as compared with naive cells, apoptosis was determined on purified CD45RA+ and CD45RO+ T cells from two aged and two young subjects using TUNEL assay. An increased proportion of TUNEL+ T cells was observed in both the naive (CD45RA+) and memory (CD45RO+) cell populations in aged subjects (CD45RA+, 15 and 20%; CD45RO+, 65 and 85%) as compared with young controls (CD45RA+, 1–2%; CD45RO+, 20–30%). 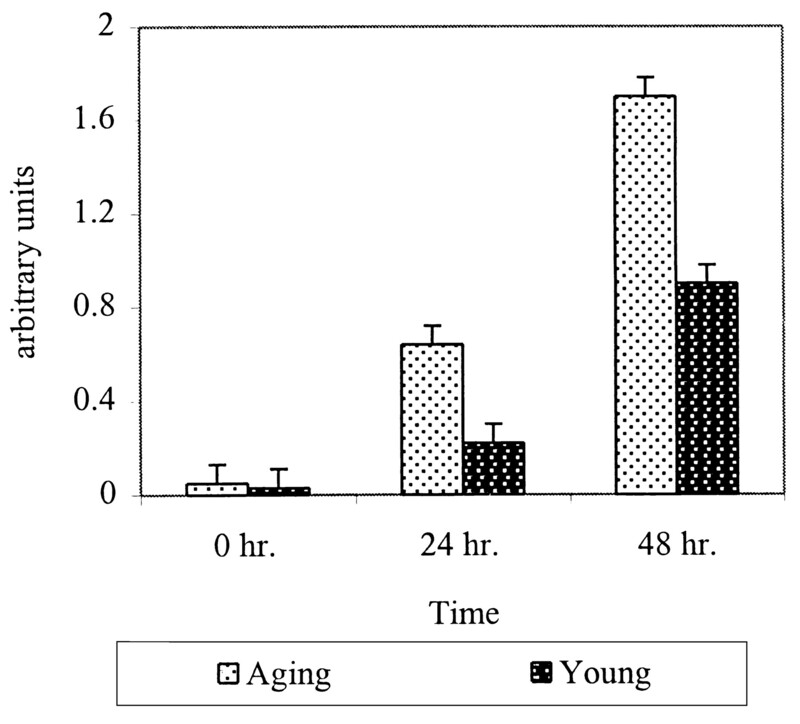 A TUNEL plot from one of the aged and young subjects is shown in Fig. 3⇓C. These data suggest that the increased T cell apoptosis observed in aged individuals was not merely a consequence of presence of increased proportions of CD45RO+ T cells in aging. TNF-induced apoptosis in T cell subsets from aged humans. A, Following culture of freshly isolated MNC, cells were treated with TNF-α for 48 h. Nicked DNA was stained with FITC-labeled dUTPs using TUNEL assay kit and PE-labeled CD4 and CD8 Abs. CD4+ and CD8+ cells were gated, and percentage of cells undergoing apoptosis was determined using FL1 channel. Mean ± SD data (in percentage of dead cells) from 10 aged and 10 young subjects are shown. B, Representative histograms from one aged and one young subject are shown. C, Representative TUNEL plot for TNF-induced apoptosis in purified CD45RA+ and CD45RO+ T cells from one aged and young subject. The DNA fragmentation following TNF treatment was also analyzed by DNA ladder using gel electrophoresis in lymphocytes from two aged and two young subjects. An increased DNA ladder was seen in aged as compared with young following TNF-α treatment (Fig. 4⇓). Furthermore, we analyzed the kinetics of DNA fragmentation following TNF-α treatment in lymphocytes from aged and young using TUNEL assay. As seen in Fig. 5⇓, there was no difference in the percentage of cells undergoing apoptosis (% TUNEL+ cells) at 24 h following TNF-α treatment between young and aged subjects. However, at 48 h, higher proportions of lymphocytes from aged were TUNEL positive as compared with young controls. DNA fragmentation in lymphocytes following TNF-α treatment. Following TNF-α treatment of cultured lymphocytes from aged humans and young subjects, cells were lysed and DNA was extracted and electrophoresed on 2% gel. Representative gels from two aged subjects and two young subjects are shown. Increased number of DNA ladder pattern is seen in aged subjects (A) as compared with young (Y). Kinetics of TNF-induced apoptosis in lymphocytes. Activated lymphocytes were treated with TNF-α for 0, 24, or 48 h. Following incubation, cells were harvested and percentage of apoptotic cells was determined using TUNEL assay. Representative graphs from one aged subject and one young subject are shown. Next, we analyzed the constitutive expression of the adapter proteins that are involved in TNF-induced signaling, on lymphocytes from aged and young individuals. The expression at the protein level was determined by Western blotting, and at the mRNA level using Northern blotting. The expression of Western blotting and Northern blotting was performed on MNC; however, at the time of the assay, there were >90% of T cells, <1% monocytes, and <5% B cell population. The blots were scanned, and the OD values obtained from the integrated volume (×10−3) are written at the top of each band. Lymphocytes from one aged and one young subject were analyzed simultaneously. The protein expression for TRADD and TRAF-2 was performed on lymphocytes from five aged and five young subjects. 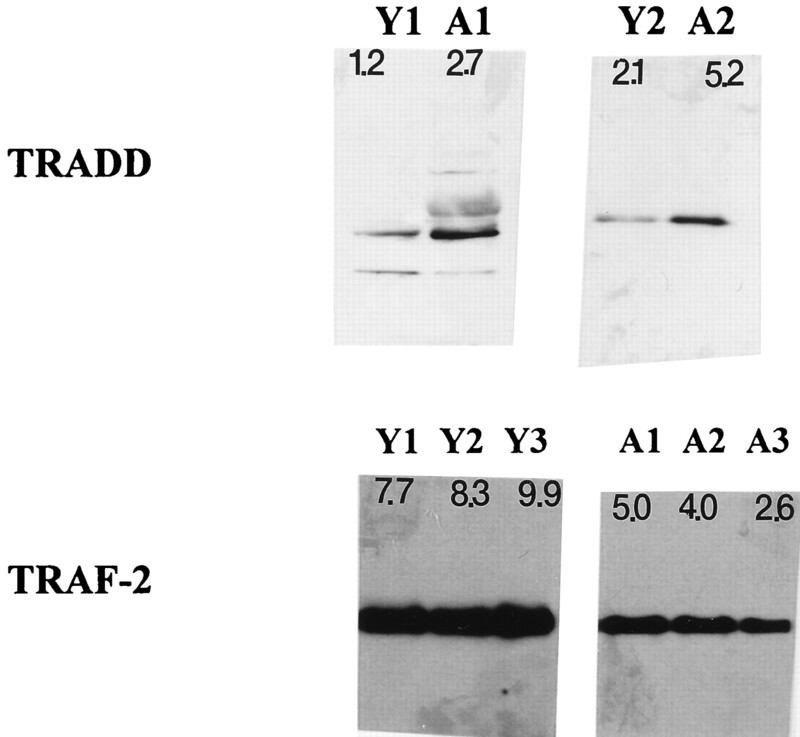 Representative Western blot gels from two aged and two young subjects for TRADD and three aged and three young subjects for TRAF-2 expression are shown in Fig. 6⇓. In lymphocytes from aged subjects, there was an increased constitutive expression of TRADD (p < 0.05) and a decreased constitutive expression of TRAF-2 (p < 0.01) as compared with TRADD and TRAF-2 expression in lymphocytes from young controls. The constitutive expression levels of RIP (p > 0.05) were comparable between aged and young (Fig. 7⇓, bottom panel). At the mRNA level also, there was an increased TRADD expression and decreased TRAF-2 levels (Fig. 8⇓) and a comparable RIP expression (Fig. 7⇓, top panel) in lymphocytes from aged subjects as compared with young controls. Expression of TRADD and TRAF-2 in lymphocytes from aged subjects. Cell lysates were prepared from freshly isolated lymphocytes from aged subjects and young subjects, and TRADD and TRAF-2 expression at the protein level was determined by Western blotting. Data from two subjects in each group are shown for TRADD expression (top panel), and from three aged subjects and three young subjects are shown for TRAF-2 (bottom panel). In aged subjects, an increased TRADD expression and decreased TRAF-2 expression are seen as compared with young subjects. 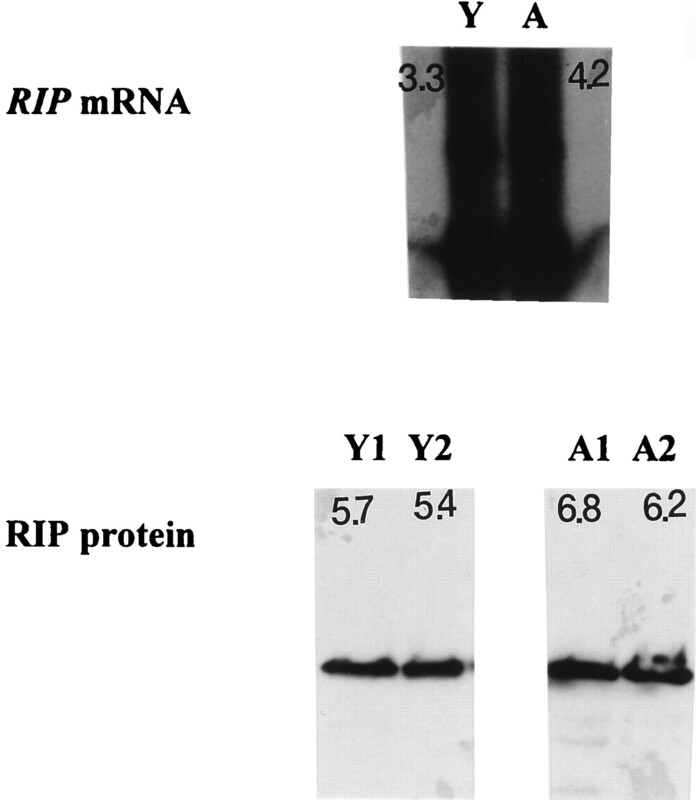 Expression of RIP at protein and at the mRNA level. Cell lysates were prepared from freshly isolated lymphocytes from aged and young subjects, and RIP expression at the protein level was determined by Western blotting. Data from two subjects in each group are shown (bottom panel). 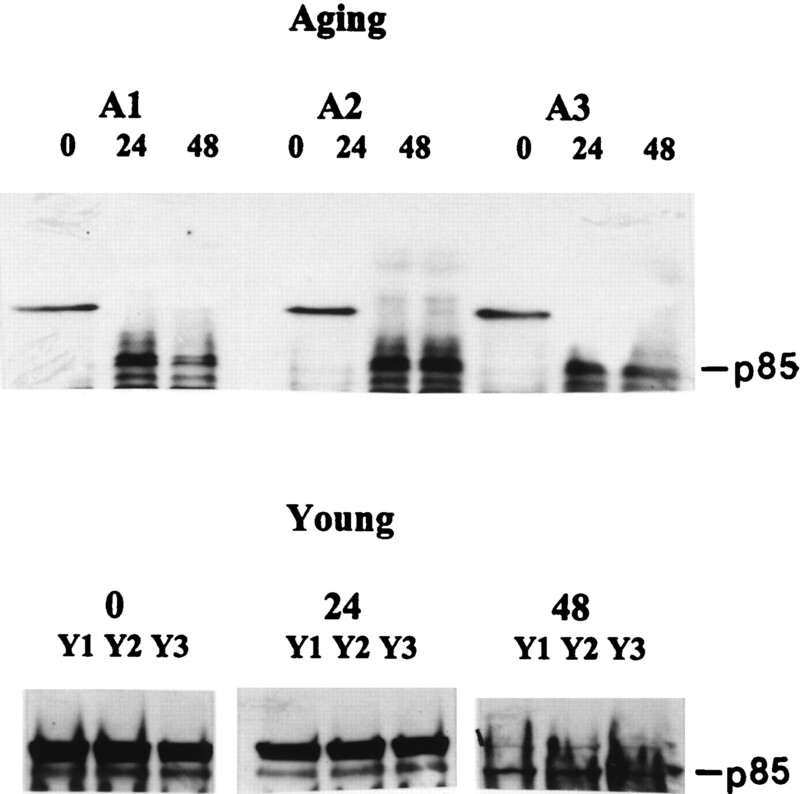 No significant difference in RIP expression was observed between aged and young subjects. Total cellular RNA was prepared from freshly isolated lymphocytes from aged and young subjects, and RIP mRNA expression was determined using Northern blotting. Data from one aged and one young subject are shown (top panel). 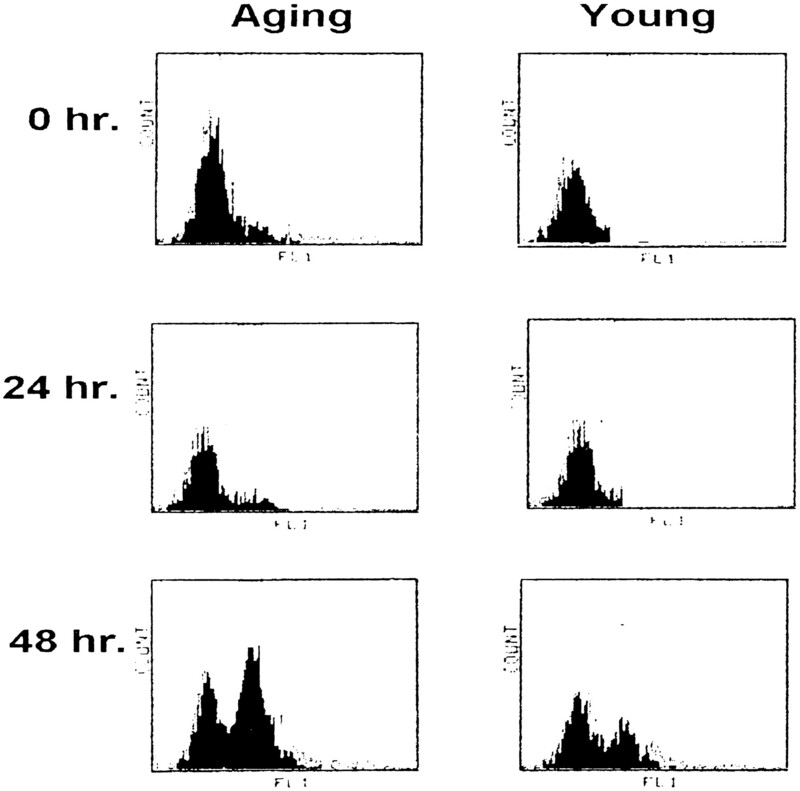 No significant difference in RIP mRNA expression is observed between aged and young subjects. Expression of TRADD and TRAF-2 mRNA in lymphocytes from aged subjects. Total cellular RNA was prepared from freshly isolated lymphocytes from aged and young subjects, and TRADD and TRAF-2 mRNA expression was determined using Northern blotting. Data from two aged and two young subjects are shown. In aged subjects, increased TRADD mRNA expression and decreased TRAF-2 mRNA expression are observed as compared with young controls. To determine whether the increased TNF-α-induced apoptosis in lymphocytes from aged subjects is associated with increased caspase activation, we analyzed the kinetics of activation of caspase-8 and caspase-3. The caspase-8 and caspase-3 cleavage activities were determined on lymphocytes from aged and young subjects at 24 and 48 h following TNF-α treatment using Western blotting. The caspase-8 activity was determined by its ability to cleave self, and the caspase-3 activity was determined by 1) its ability to cleave a peptide substrate (DEVD-pNA) to release a colorimetric substrate, pNA, and 2) its ability to cleave its 116-kDa substrate PARP to release a 85-kDa fragment. Fig. 9⇓ shows cleavage of caspase-8 following TNF-α treatment in three aged and three young subjects. An early cleavage of caspase-8 in lymphocytes from aged subjects (24 h following TNF-α treatment) was observed as compared with that from young controls (48 h following TNF-α treatment). Increased caspase-8 activity in lymphocytes from aged subjects. Activated lymphocytes (as described in cell culture) from aged and young subjects were treated with TNF-α for 0, 24, or 48 h. Cell extracts were prepared and Western blotting was performed using Ab against p20 (cleaved form of caspase-8) fragment of caspase-8. Data from two aged and one young subjects are shown. Fig. 10⇓ shows data (mean ± SD) obtained from five aged and five young subjects by quantitative spectrophotometric determination of caspase-3 activity. Following TNF-α treatment, there was an early increase in caspase-3 activity (24 h) in lymphocytes from aged subjects as compared with that from young controls (48 h). Fig. 11⇓ shows the caspase-3 activity (in its ability to cleave PARP) in three aged and three young subjects following TNF-α treatment. In lymphocytes from aged subjects, there is an early detection of PARP cleavage fragments (24 h) as compared with that in young controls (48 h). Caspase-3 activity in lymphocytes from aged subjects. Activated lymphocytes from aged and young were treated with TNF-α for 0, 24, or 48 h. The cells were then incubated with specific caspase-3 substrate, DEVD-pNA, for another hour, followed by detection of the reduced substrate (pNA) using spectrophotometer at 405 nm. Mean (±SD) data from five aged and five young subjects are shown. Cleavage of PARP in lymphocytes from aged and young. Activated lymphocytes (as described in cell culture) from young and aged subjects were treated with TNF-α for 0, 24, or 48 h. Following incubation, cell lysates were prepared and PARP cleavage was examined by Western blotting. Cleaved form of PARP (p85) was seen at 24 h in aged as compared with 48 h in young. In the present study, we have shown that in lymphocytes from aged humans, there is an increased susceptibility of both CD4+ and CD8+ T cell subsets to undergo TNF-α-induced apoptosis. Furthermore, the increased apoptosis in lymphocytes from aged humans was associated with increased TNFRI expression and a decreased TNFRII expression. We have shown that the constitutive expression of TRADD was increased and that of TRAF-2 decreased in lymphocytes from aged humans as compared with that from young controls. An increased and early activation of caspases (caspase-8 and caspase-3) involved in the TNF/TNFR pathway was observed in lymphocytes from aged humans. TNFRI mediates most of the biological properties of TNF, including programmed cell death and activation of transcription factor NF-κB 16, 17 . Upon oligomerization, TNFRI binds to and recruits TRADD and indirectly binds to FADD via interaction between death domain of FADD and TRADD. FADD, in turn, binds to caspase-8 through death effector domain, which, upon activation, is cleaved into enzymatically active form (p20), leading to the activation of the caspase cascade that includes caspase-3, resulting in apoptosis 17, 18 . TRADD also interacts with TRAF-2 to signal activation of transcription factor NF-κB 19 . TNFRII lacks death domain and interacts directly with TRAF-2 via TRAF homology domain 20, 21, 22, 23 . TRAF-2 is required for the recruitment of cellular inhibitor of apoptosis protein family to the TNFRII signaling complex and antagonizes T cell apoptosis 24 . TRAF-2 also activates both NF-κB and JNK and mediates its antiapoptotic effect 25, 26, 27 . Therefore, TNFRII is involved in antiapoptotic effect of TNF, whereas TNFRI is involved in both apoptotic and antiapoptotic signaling. TNFRI overexpression has been shown to trigger cell death 28 . In this study, we have observed an increased TNFRI expression in T cells from aged humans as compared with young controls. The increase was observed both in the percentage of cells expressing TNFRI as well as in the MFC#, the latter suggesting increased levels of TNFRI. Ware et al. 29 have an up-regulation of TNFRI expression and down-regulation of TNFRII following T cell activation. In the present study, we have observed an increased TNFRI expression and a decreased TNFRII expression in aged subjects. This may suggest an in vivo activation of T cell subsets in aged humans as compared with young controls. However, we did not observe any significant differences in the expression of activation Ags (CD25, CD38, CD69) in CD4+ or CD8+ T cell subsets between aged and young humans. In aging, a shift from naive (CD45RA+) to memory (CD45RO+) T cells has been reported 30 . Therefore, increased apoptosis in T cell subsets could be due to an increased apoptosis in CD45RO+ T cells. However, we observed that both CD45RA+ and CD45RO+ T cells underwent increased TNF-induced apoptosis in aged subjects as compared with young subjects. Herndon et al. 31 reported increased Fas-mediated apoptosis in CD45RA+ T cells in aging, and Phelouzat et al. 32 reported increased apoptosis in CD45RO+ T cells; however, these investigators did not examine reciprocal subsets. These studies as well as our present study suggest that increased apoptosis of T cells in aged humans is not merely due to a shift in CD45RO+ T cells. Similarly, increased Fas-mediated apoptosis has been observed in both CD45RA+ and CD45RO+ T cells in HIV infection 33 . Both TNFR-1- and CD95-mediated apoptotic pathways use FADD as a common conduit 34 . The increased activation-induced apoptosis, Fas-mediated apoptosis 10, 31, 32, 35 , and TNF-mediated apoptosis observed in the present study suggest that multiple signaling pathways of apoptosis may play a role in T cell lymphopenia and T cell dysfunction in human aging. Overexpression of TRADD results in apoptotic cell death in many cell lines, which is similar to TNF-induced cell death 36 . TRAF-2 has shown to be involved in regulation of lymphocyte function and growth in vivo. TRAF-2 appears to be required for NF-κB activation induced via both TNF receptors 17, 19, 22, 23 . Recently, it has been shown that NF-κB activation acts as a break for apoptosis 37, 38, 39 . In addition, TRAF-2 mediates JNK activation via TNFRI 25, 26, 27 . Therefore, TRAF-2 exerts its antiapoptotic effects in lymphocytes via both TNF receptors. Lee et al. 40 have shown that TRAF-2 induced NF-κB-independent antiapoptotic pathways during TNF-induced apoptosis, and inhibition of TRAF-2 leads to splenomegaly, lymphoadenopathy, and increased number of B cells. Mice deficient in TRAF-2, traf-2−/−, appear to be normal at birth, but become progressively runted and die prematurely. In these mice, thymocytes and other hemopoietic progenitors were shown to be highly sensitive to TNF-induced cell death, and serum TNF levels were found to be elevated 41 . It is interesting to note that in aged humans, serum TNF levels are increased 11, 12, 13, 14 , and in the present study, we have observed an increased TRADD expression, decreased expression of TRAF-2, and increased sensitivity to TNF-induced apoptosis. Our observation of decreased TRAF-2 expression in aged humans suggests that decreased TRAF-2 would result in increased TNF-induced apoptosis via NF-κB-dependent or NF-κB-independent pathway. Recently, cells lacking STAT proteins have been shown to be resistant to TNF-induced apoptosis 42 . The defective apoptosis was shown to be associated with low constitutive levels of caspases, including caspase-3. This would suggest that constitutive levels of caspases might play a role in apoptotic pathway. We have observed an increased constitutive expression of caspase-8 and caspase-3 in lymphocytes from aged humans as compared with young (Aggarwal and Gupta, manuscript submitted for publication). In the present study, we have observed an early and increased activation of caspase-8 and caspase-3 following TNF-α treatment. Increased activation of caspases in lymphocytes from aged humans could be due to increased number of cells undergoing apoptosis. However, the time kinetics studies show an early activation of caspase-8 (24 h following TNF-α treatment) and caspase-3 (24 h following TNF-α treatment) in lymphocytes from aged humans at a time when no apoptosis is observed by TUNEL assay. Apoptosis by TUNEL assay is observed at 48 h. This would suggest that increased activation of caspases, at least in part, appears to be due to actual increase in activation rather than simply due to increased number of cells undergoing apoptosis. Therefore, increased constitutive expression of caspases in lymphocytes from aged humans may play a role in increased apoptosis. There appears to be a paradox that in aging there is an increased level of TNF-α and increased TNF-induced apoptosis in T cell subsets, yet there are increased proportions of T cell subsets expressing TNFR-I. However, similar observations have been observed in patients with idiopathic CD4 lymphopenia 43 and DiGeorge anomaly 44 in which increased Fas-mediated or spontaneous apoptosis of T cells associated with increased proportions of Fas/FasL-positive cells. In human aging and in HIV infection, increased Fas-mediated apoptosis 10, 33, 36 is associated with increased proportions of Fas/FasL+ T cells. It is likely that there is a constant up-regulation of Fas/FasL and TNF/TNFR-I systems that might contribute to progressive T cell deficiency in aging. In summary, lymphocytes in aged humans are more susceptible to TNF-induced apoptosis, which is associated with increased activation of apoptotic pathway and decreased expression of molecules (TNFRII and TRAF-2) involved in antiapoptotic pathway of TNF-α-induced cell death. Increased serum levels of TNF and increased susceptibility of T cells to TNF-induced apoptosis may play a role in the pathogenesis of lymphopenia and lymphocyte dysfunction associated with human aging. We thank Dr. D. V. Goeddel for his kind gift of plasmids encoding full-length TRADD, TRAF-2, and RIP. ↵2 Abbreviations used in this paper: NF-κB, nuclear factor-κB; DEVD-pNA, DEVD-p-nitroamilide; DPBS, Dulbecco’s phosphate-buffered saline; FADD, Fas-associating death domain protein; FasL, Fas ligand; HRP, horseradish peroxidase; MNC, mononuclear cell; PARP, poly(ADP-ribose) polymerase; PE, phycoerythrin; RIP, receptor interacting protein; RT, reverse transcriptase; TRADD, TNFR-associated death domain protein; TRAF, TNFR-associated factor 2; TUNEL, terminal deoxynucleotidyltransferase-mediated UTP end labeling; MFC#, mean fluorescence channel numbers.